In the early 1980s, Philip King, then president of the American Schools of Oriental Research, introduced Lawrence E. Stager to two of his trustees and friends, Leon Levy and Shelby White. King presented Stager as a creative archaeologist who liked to explore untried ideas to see what happens regardless of the consequences. In 1984 there was a convergence between Leon and Shelby’s interests in supporting Stager and in undertaking the excavation of a large, prominent site and the interests of Benjamin Mazar, who was looking for the right archaeologist, with sufficient funding, to tackle the site of Ashkelon. Mazar’s stature and his influential position as the head of the Council on Archaeology helped launch the Leon Levy Expedition to Ashkelon in 1985, upon receiving a license from the Israel Antiquities Authority. The Leon Levy Expedition has been conducting large-scale excavations on the tell of ancient Ashkelon since 1985, thanks to the great generosity of Mr. Leon Levy and Ms. Shelby White of New York. 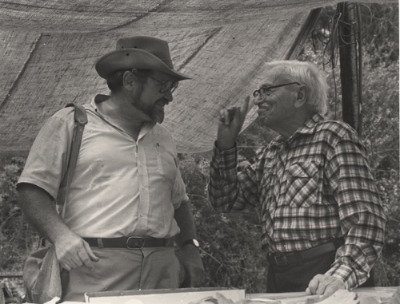 Every summer from 1985 to 2000, Leon and Shelby visited Ashkelon during the excavation season, taking the trouble to meet the expedition staff and often working with dig volunteers and professional staff in the field. The first phase of excavation featured seventeen seasons of excavation sponsored by the Semitic Museum at Harvard University, including sixteen consecutive seasons from 1985 to 2000 that were conducted on a large scale, and a smaller excavation in 2004. In addition, there were study seasons in Ashkelon to process excavated material in 2001, 2005, and 2006. In most years from 1985 to 2000, excavations were conducted over a seven-week period from mid-June to the end of July. In some years, however, there was an additional five-week period of excavation in May and early June, for a total of twelve weeks of digging (these extended seasons took place in 1988, 1990, 1992, and 1994). In the summer of 2007, a second phase of large-scale excavations at Ashkelon commenced under the field directorship of Daniel Master still supported by Shelby White and the Leon Levy Foundation. Today, Lawrence Stager and Daniel Master continue the work at Ashkelon in order to honor Leon and Shelby's original vision, to conduct an innovative exploration of our shared human past. The Leon Levy Expedition has been fortunate to have had a large and capable staff of profesional archaeologists. The expedition has also depended on large groups of enthusiastic dig volunteers of all ages, typically numbering 80–100 per excavation season, who came to Ashkelon from North America, Europe, and many other places around the world. Many of these volunteers returned season after season, in some cases advancing to professional status as field supervisors. In addition to learning stratigraphic excavation and recording methods in the course of digging, the volunteer staff participated in evening lectures and weekend field trips to archaeological sites throughout Israel. The Expedition is actively publishing a series of final reports. Of course, these are “final reports” in only a qualified sense, because the conclusions of today will, in the cumulative discipline of archaeology, be only prologues for what will come tomorrow.